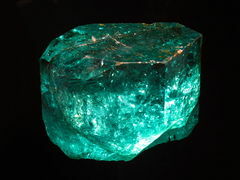 A green gemstone focusing the energy of the fifth ray. A gemstone was believed by the Hindus to confer the gift of memory and of knowledge of secrets and future events. Aristotle and others believed it conferred foresight, insight, and “second sight.” By tradition, the owner of an emerald never becomes poor. Romans believed that it discovered falsehood and treachery by turning pale. Pulverized emerald was used in the 17th century for eye injuries. It was reputed to deter evil spirits, astral influences and neutralize poisons. Vedic scripture says the emerald could neutralize poisons and snake bites. One Hindu name for emerald is garalari, “enemy of poison.” Pliny told of an old Hebrew tradition that if a serpent fixes its eyes on an emerald, it becomes blind. Upon the elm, emerald’s virgin blaze. The emerald focuses abundance and clear vision. With the amethyst it is the source of precipitation. It enables you and assists you in bringing ideas into form. Hence it is the stone of the City Foursquare, bringing the kingdom of God into manifestation on earth. It carries the power of sound, the soundless sound and music. Elizabeth Clare Prophet, October 18, 1987. Elizabeth Clare Prophet, October 2, 1987. This page was last modified on 6 March 2017, at 12:46.